What to Say, How to Say It. The Secrets of Getting Ahead. Do you know how to ask for help at work without sounding dumb? Do you know how to get valuable and useful feedback from your colleagues? Have you mastered your professional elevator pitch so that every time you meet someone, they remember and are impressed by you? If you answered "no" to any of these questions, you need Great on the Job. With case studies, micro strategies, and example language, readers will learn communication skills that can be practiced and implemented immediately. Whether you're a star performer or a struggling novice, Great on the Job will give you the building blocks you need to communicate at work. 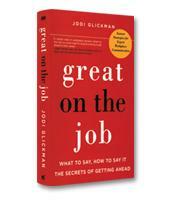 Jodi Glickman, communications consultant and author of Great on the Job, once applied to Cornell's Park Leadership Fellowship program, a $72,000 two-year scholarship for Cornell's Johnson Graduate School of Management. Glickman was not offered the scholarship. Undeterred, she phoned the director of the program to lobby for the award; the next day the program director personally called her to offer her the fellowship. Glickman's life story, which includes time spent as a Peace Corps Volunteer in Chile and as an investment banker for Goldman Sachs, is filled with many remarkable triumphs of communication (including ranking first out of more than 300 Goldman Sachs associates in communication). With straightforward two- or three-step strategies, Glickman tries to share the fundamental secrets of her extraordinary communication skills. Step one: Ask for timing/expectation. Get the details, ask for time to think about it, then either confirm the assignment with the manager or move to step two. Step two: Be transparent about your workload. If the timing or parameters aren't doable, explain what's on your plate and ask for time to come up with an alternate timeline. Don't accept an unrealistic deadline. Step three: After serious consideration, present a detailed timeline and action plan for completing the project. Generosity. Sharing information, sharing credit, and keeping others' agendas and schedules in mind will go a long way toward smooth communication and cooperation. Initiative. Asking, "How can I help?" is not actually all that helpful, Glickman argues. Give people choices so that they don't have to dream up answers on their own. Forward Momentum. This is Glickman's phrase for nurturing and maintaining relationships that may prove to be vital in the future. Transparency. More than just a question of honesty, transparency means volunteering difficult information, whether it's alerting people to problems and mess-ups or acknowledging when you don't know something, writes Glickman. Transparency is key in many of the strategies in Great on the Job. It's also vital to be strategically proactive, Glickman writes. 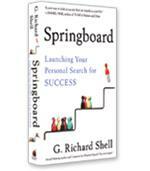 Excelling at the work you are given is not enough to advance. Success depends on proactively learning new skills, assisting others and knowing how to diplomatically redirect unwanted tasks (by accepting the task, but emphasizing that you are interested in more challenging or valuable assignments). In the second part of the book, readers learn how to "move up the learning curve" by managing expectations, and knowing how to ask for help and feedback. "Stay out of Trouble" is the third part of the book, and includes advice on how to raise a red flag and manage a crisis. The final chapter is on selling yourself. And there is perhaps no better person to give advice on selling yourself than an author who only needed a casual conversation to vault over 10 competing classmates and land a prized internship.